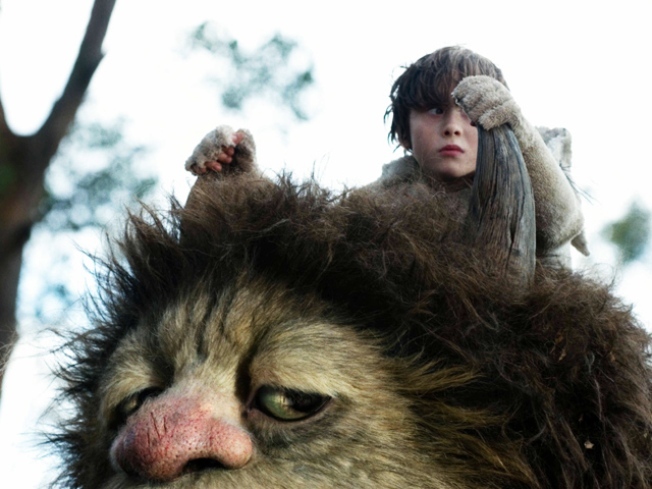 "Where the Wild Things Are" is good, but not great, says reviewer. There’s so very much to like about Spike Jonze and Dave Eggers’ adaptation of Maurice Sendak’s beloved book “Where the Wild Things Are” — it fleshes out the original’s themes brilliantly, it’s lovely to look at and listen to — but it winds up being a well-crafted vehicle that never soars. While many of the individual filmmaking choices are intelligent, the finished product lacks that spark of magic that marks a classic. Sendak’s tale is a simple one: Max misbehaves and sent to his room without supper. He travels night and day to the land of the wild things. They romp together, and Max is crowned king. He feels lonely and comes home, where his supper is waiting for him. In expanding this tale to three acts, Jonze and Eggers do right by the story. Max (brought to wonderfully unaffected life by young actor Max Records) lives with his sister, who is getting just old enough to ignore Max for her teenage friends, and their divorced mother. Early on, we see Max build an igloo and then mischievously toss snowballs at his sister’s pals; Max laughs. Then one of the older boys destroys the igloo, and his sister drives away, uncaring; Max cries. Then he dumps snow all over the sister’s room and breaks her belongings; Max rages, then cries some more. It’s rare that movies get the kid’s-eye view of the world so spot-on, where feelings are volatile and change on a dime. This opening prologue of the film stands aside movies like “Forbidden Games” and “Pan’s Labyrinth,” putting us right inside Max’s head and letting us see his world the way he does. Later, after once again losing control of his emotions, violently so — this time with his mother (Catherine Keener) — Max sails off to the land of the wild things, where he meets a menagerie of tall and large-headed beasties, including the crabby and melancholy Judith (voiced by Catherine O’Hara) and her devoted partner Ira (Forest Whitaker), the shy Alexander (Paul Dano) and the steadfast Douglas (Chris Cooper). It’s Carol (James Gandolfini) to whom Max grows closest, and the two dream of building a place where only the things you want to have happen, happen. In the book, Max’s first proclamation after being named king is to send the wild things to bed without their supper; kids, after all, often project themselves onto their imaginary friends, even punishing stuffed animals for their owner’s trespasses. Similarly, here, Carol comes to embody the best and worst of Max’s personality, and in observing how Carol treats his fellow creatures — especially the love of his life, K.W. (Lauren Ambrose) — Max learns how his own behavior affects the people who care about him. Not that the movie knocks you over the head with any kind of lessons or moralizing; the rare feat that Jonze and Eggers accomplish is to credit the audience with enough intelligence to connect the dots themselves. The production design by K.K. Barrett is both lyrical and gritty, creating exuberantly swooping architecture but building it with sticks and mud. Sendak’s designs come to vivid life with the creatures themselves, which boast Henson Creature Shop bodies and seamlessly CG’d faces that display a full range of emotion and expression. And Karen O. of the Yeah Yeah Yeah’s has collaborated with Carter Burwell to create a score that reflects childhood’s wonderment, fears and longing. I just wish all the pieces of “Where the Wild Things Are” fit together better for me. It’s the kind of film that had me quantifying its strong points at a distance while never enveloping me with its mood or storytelling. It’s a film that will have its admirers and detractors, but I can’t be alone in thinking that it represents an artistic achievement that somehow keeps its wild heart firmly locked inside a gilded display case.